Synonyms—Mountain Balm. Consumptive’s Weed. Gum Bush. Bear’s Weed. Holy or Sacred Herb. Eriodictyon Californicum (Hook and Arn.). Description—A low, shrubby evergreen plant, 2 to 4 feet high, found growing abundantly in clumps on dry hills in California and Northern Mexico. The stem is smooth, usually branched near the ground, and covered with a peculiar glutinous resin, which covers all the upper side of the plant. Leaves, thick and leathery, smooth, of a yellowish colour, their upper side coated with a brownish varnish-like resin, the under surface being yellowish-white reticulated and tomentose, with a prominent midrib, alternate, attached by short petioles, at acute angle with the base; shape, elliptical, narrow, 2 to 5 inches long 3/4 inch wide, acute and tapering to a short leaf-stalk at the base. The margin of the leaf, dentate, unequal, bluntly undulate. The flowers, bluish, in terminal clusters of six to ten, in a one-sided raceme, the corolla funnel-like, calyx sparsely hirsute. Constituents—The chief constituents are five phenolic bodies, eriodictyol, homoeriodictyol, chrysocriol, zanthoeridol and eridonel. Free formic and other acids, glycerides of fatty acids; a yellow volatile oil; a phytosterol, a quantity of resin, some glucose. Taste, balsamic and sweetish, afterwards acrid, but not bitter, recalls Dulcamara and creates a flow of saliva. Odour, aromatic. The leaves are brittle when dry, but flexible in a warm, moist atmosphere. Eriodictyon Californicum is official in the United States Dispensary. Alcohol is the best agent for the fluid extract of the dried plant. Medicinal Action and Uses—Recommended for bronchial and laryngeal troubles and in chronic pulmonary affections, in the treatment of asthma and hay-fever in combination with Grindelia robusta. Likewise advised for haemorrhoids and chronic catarrh of the bladder. Much used in California as a bitter tonic and a stimulating balsamic expectorant and is a most useful vehicle to disguise the unpleasant taste of quinine, Male fern and Hydrastis. In asthma, the leaves are often smoked. Aromatic syrup is the best vehicle for quinine. Other Species—E. tomentosum, often found growing next to E. Californicum, especially in South California, but is easily distinguished from E. Californicum, being a larger shrub, and having a dense coat of short, villous hairs, colouring with age, whity-rusty; corolla, salver-shaped; leaves oval or oblong, and obtuse. The Chumash tribe, natives to the mountains here in the Los Padres National Forest of California, have high regard for the medicinal power of Yerba Santa. I am fortunate to have over an acre of Yerba Santa in native growth on my ranch. Last summer I harvested the Yerba Santa flowers with leafy branches about one foot long when ready at the peak of florescence in mid-June. The plant material filled a 10 gallon size cardboard box. The Yerba Santa dried and cured in the box for two weeks. Then I broke it up into smaller pieces and put it into a 5 gallon stainless steel pot and covered it with rectified neutral spirits purified and concentrated from charcoal filtered vodka. This Yerba Santa massa digested in the spirit for three weeks. 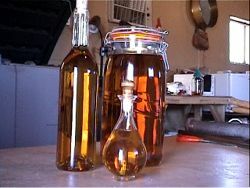 After three weeks digesting in the spirit the dark tincture of Yerba Santa was poured off the massa; the residual tincture was removed from the massa with a small wine press. The tincture of Yerba Santa was poured into a stainless steel kettle converted into an old style classic Mongolian type distilling unit. The spirit was separated from the tincture through slow low temperature evaporative distillation (heat no more than is bearable for the palms of the hands to touch the kettle for 10 seconds). The volatile sulfur, which is the aromatic essential oil of the plant, distilled with the spirit forming a most pleasant conjunction. This conjunction of the spirit and volatile sulfur was collected and stored in glass bottles. The dark watery menstrum of the tincture remained in the vessel. Much sticky tar coated the bottom of the kettle. Diethyl ether was added to the warm menstrum and allowed to absorb the fixed sulfur of the Yerba Santa. The dark mixture was poured out of the kettle into a tall glass jar to settle. The ether layer floated on top. It was a deep green color. The bottom dark watery layer was siphoned off; it was sticky sludge at the bottom. The smelly menstrum was saved for later. Distilled water was added to the jar containing the ether/fixed sulfur solution. The solution was shaken to mix it. The water layer on the bottom was not as dark as the first water. This water was siphoned off also. More distilled water was added to the ether solution and the whole shaken as before. After three water washings the ether gave up no more color to the water indicating the fixed sulfur was purified. The ether was evaporated out exposing the fixed sulfur with a small portion of the volatile sulfur above it. The volatile sulfur was yellow with some greenish color and it flowed freely at room temperature. The fixed sulfur was translucent emerald green in color; it was very thick and would not flow at room temperature. Both the fixed and volatile sulfurs had very pleasant aromas. This was saved for later. 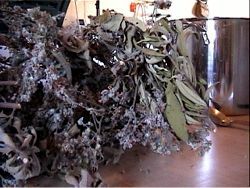 The massa of the Yerba Santa was incinerated after the tincture was pressed out. Residual spirit moistening the massa after pressing was easily ignited. When the spirit had burned out the dry charred massa was placed in a calcining oven at 500o F. After two to three hours the hot massa was taken out of the oven and ground up with a steel pestle then placed back in the oven. This procedure was done three times in 24 hours. The resulting powder was a light gray uniform dust called the alchemical earth of the Yerba Santa. The alchemical earth was extracted with hot distilled water and poured through two layers of coffee filters. The earth that remained in the coffee filters was saved for later. The slightly yellow-orange solution was poured into a Pyrex serving dish and placed into the oven on low temperature to evaporate. When the water had evaporated the alchemical salt of the earth was left in the bottom of the dish. This salt of the earth was calcined and ground as the earth before. Then it was extracted with hot distilled water as before. Then the water was evaporated as before exposing the salt of the earth. This time the salt formed white crystals. The crystals were ground down again, calcined again and extracted with distilled water again and the water was evaporated off again. This time the salt of the earth was pure white with crystals running in dentritic veins across the dish. These pure crystals of the salt of the earth were stored for later. The smelly menstrum with sludge saved from the ether/fixed sulfur separation was cooked down to the black coal stage then calcined. The coal was ground down with the steel pestle during calcination as described in calcining the massa. The calcination stopped when the earth of the menstrum was a light gray powder. The salt of the menstrum was extracted from this earth of the menstrum in the same way as the salt of the massa was extracted from the earth of the massa. The purified salt of the menstrum were saved for later. The sticky stinky tar in the bottom of the kettle was scrapped out (very messy) and put in a stainless steel sublimator and heated. Terrible foul smelling fumes came off with a red liquid sublimating on the walls above the tar. The stench was too bad to continue so the tar was scrapped out of the sublimator and placed in the calcining dish and put into the calcining oven. After a few hours a most pleasant aroma came off the calcining tar. The smell of fresh vanilla filled my workshop. The tar cooked down to hard coal then was ground up while hot with the steel pestle, and calcining continued until the earth of the tar was a gray powder. The earth of the tar was extracted with distilled water same as with the earth of the massa. Thus the salt of the tar was revealed after evaporation of the water. The salt of the tar was purified in the same way as the salt of the massa and saved for later. The conjunction of the spirit and volatile sulfur was placed in the Mongolian type still with the salt of the massa and left over night. The next day the salt had been absorbed. The still was then heated to evaporative temperature and the deep emerald green fixed sulfur was added to this Essence of Yerba Santa in the still and circulated for 24 hours. After 24 hours the still was opened and the Elixir of Yerba Santa there circulating had turned gold in color. The salt of the menstrum was added the golden Elixir of Yerba Santa and circulated for 24 hours. Then the salt of the tar was added to the circulating Elixir. All of the purified principles of the Yerba Santa were then together and the still was closed and the Elixir was circulated for 7 days. After seven days circulating the Elixir of Yerba Santa was poured into glass jars and allowed to settle for 24 hours. Then the completed golden Elixir was decanted into wine bottles for storage. The sticky smelly tar was difficult to clean off the equipment. The kettle was washed with dish soap and hot water. The scrubber became clogged with the tar. However the washing dissolved the bad smelling component leaving a very pleasant smelling resin that was not soluble in ether, nor did it want to dissolve into alcohol or water. This water washed resin balsam had the aroma of fresh vanilla the same as the tar during calcining. Next season I will work the tar component by water washing to experiment with this pleasingly aromatic balsam. Also I believe the horrid smelling fraction of the tar was formic acid. One storage bottle of Elixir of Yerba Santa was poured into several 2 ounce cobalt blue bottles with eye dropper caps for therapeutic utilization. The viscosity of the Elixir is such that only half a dropper full can be drawn at once. Three half droppers is the dosage that works for me. It is placed either directly on the tongue and mixed with saliva or diluted in about five times as much mineral water and swallowed. The Yerba Santa Elixir has a very pleasant taste, but the spirit can be too hot for some to take straight, thus the water dilution. One reported good results from just applying the Elixir to the temples and forehead. This elixir is an excellent remedy for hay fever and other allergens that affect the lungs and bronchial pathways. I suffer from chronic seasonal hay fever. Some seasons the sage pollen gets so thick in the air that I get allergic bronchitis. I have tried everything in the past to get relief. Before this elixir I had found a 1000/1 homeopathic dilution of sage pollen was the best remedy, but it didn’t work when the pollen was thick in the air. The Elixir of Yerba Santa gave me complete protection this year even though the sage pollen production was especially prolific. The elixir also imparts a refreshing feeling especially in the lungs and a mild invigorating mental alertness. It also provides some pain relief to swollen joints, especially from repetitive work. The Yerba Santa Elixir is also very good for inner alchemy. The energy easily goes into circulation and is especially good to penetrate the kidney belt circuit. It produces good balance in the spinal channels and opens some blocks (or makes repairs) in the front organ channels. “Man’s a microcosm, or a little world, because he is an extract from all the stars and planets of the whole firmament, from the earth and the elements; and so he is their quintessence.” – Theophrastus Paracelsus, Swiss alchemist of the 16thcentury. As readers of the Alchemy Journal are no doubt aware, some major shifts have been taking place on our planet just recently – causing things to become quite interesting! Our political, medical, educational, social and religious institutions are all undergoing scrutiny and radical changes – and with these changes comes a need for us to look at ourselves. This need for personal discovery is actually a blessing in disguise – as we have discovered that the old, worn-out, limiting beliefs and unresolved emotional traumas all challenge our cherished illusions as to who we are. The inner drive of becoming a whole, multi-dimensionally aware, higher self-aligned being is now a prime goal for many people, but the actual clearing process can be so intense it can daunt even the hardiest of souls! And as we shift our beings into a higher octave of awareness, authenticity and integrity, so will our outer world – our collective reality – shift, as indeed it must. For you see, we have long passed the point of no return for the earth on this 3rd dimension. She must move forward into a more refined state of being, for that is what she has chosen to do and she is taking all of us with her. But do we choose to move with her, not in a state of resistance and fear, but in an accepting and trusting surrender to all that is good and pure within us? And how do we move forward after so many incarnations of pattern-driven, fearful behavior? How can we learn to live in harmony with other human beings, the devic, animal, plant, elemental and mineral kingdoms? Perhaps understanding the alchemical process can give us a roadmap for the spiritual path we must tread if we are to make the changes required for our growth. Alchemy may be defined as: “the chemistry of the middle ages, the chief aim of which was to change the baser elements into gold”. It was a specialized science in which only a few people truly lived up to the label – alchemist – as there were many charlatans, few authentic. A few of the clear-visioned who were the real thing include Flammel, Paracelsus and the Comte de Saint Germain. They knew that this was only one aspect of alchemy and that the true art and science is a purification process, a psychological transformation. As in the alchemical lab, both physical and psychological processes pursue pure essence. There are three overall stages in the alchemical process: Separation, Purification and Recombination. Separation (or distillatio), requires the breakdown and destruction of useless attitudes or negative patterns, leaving us with a more purified version of ourselves. We are purged of denseness each time we go through this process. When we place ourselves in the crucible, we may facilitate the transformation by the use of the rainbow rays or flames. These are not actual physical flames, but rather, specific colors which are imagined or visualized. When you wish to change colors, you just state your intent, which then must manifest your desire. 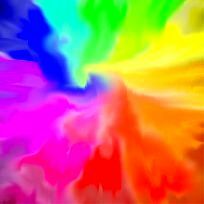 These flames are stepped-up frequencies of the color rays and each ray or flame has a specific function on our physical, cellular, etheric, emotional, mental and spiritual bodies. The crystalizing clear flame contains all the other flames within it. For example, when we visualize the crystalizing clear flame, clarity and truth are revealed. This is a great flame to be used in this first stage of the alchemical process, when the message needs to be delivered to us and it is necessary to see the dreamer (ourselves) and the dream (our illusory world) simultaneously at an esoteric level. The flame is also to be envisioned when we may not be as awake at the 3rd dimensional level as we could be. We may also call on the clear flame¹s energy to clear issues of control. Purification (or sublimatio ) is an uplifting process that transforms a condensed substance into one that is less dense. The soul is temporarily freed from the earth plane, perhaps through out-of-body soul travel, or other states of cosmic awareness such as teleportation or levitation. An excellent flame to use in this step is the opalescent white flame as it helps us to see the truth and beauty which is in us. This white flame connects us with our guidance and lightens all aspects of ourselves. Summon this flame to clear issues of truth and feelings of separation. Recombination (or coagulatio) is the condensation of purified, compressed substances while working in the alchemical lab. When pursuing transformation of the psyche, the same result occurs. A new, purely refined essence results from both processes and as we pass through this stage an opportunity is offered for a reunion with all that is pure within. This state of self-realization may be immediately known, or many more rounds of distillation may be required. Coagulation is the reconnection with a more harmonious, yet grounded lifestyle and it is in this spiritual state that we are released from a limited personal view and connected for a time with our guides, higher self and obtain a more holistic viewpoint. An incredible flame to assist in this process is the transmuting violet flame, popularized by the alchemist, St Germain. Use it when you wish to change from one form, nature or condition into another. It brings purity, knowledge and wisdom to the user as well as cleansing, purifying and bringing us back to a state of balance. We have understood and practiced a limited range of physical laws. We can perceive matter as our created world in which we live and gravity – that which holds us onto the surface of the earth, but there are other forces at work – forces which we are only beginning to understand. In duality there has to exist two opposing forces : for example, good and evil. Therefore, if there is matter, there must be anti-matter. If gravity exists, so must its opposite force, anti-gravity. When then could we not incorporate them for a full experience of this plane? Only a few people throughout recent history have understood the inherent nature of physical laws of duality, which are ultimately an illusion. The spiritual alchemical process, in addition to purifying and elevating us, also enables us to see the illusory nature of things, recognizing that only Oneness is real. Therefore, when we activate and incorporate natural forces such as gravity, anti-gravity, matter and anti-matter we become the true alchemists we were intended to be. It is then that we are better able to understand our observer/participant nature and become more aware of the mysteries of life, and our own greatness. In addition, (in our own mind) we seem to be relatively insignificant in the grand scheme of it all, like a grain of sand on a beach – but never underestimate the unfolding empowerment that can evolve from that perspective, should we choose to fully encompass that infinitesimal aspect of ourselves. We are the mystery of our own creation while we simultaneously create our own reality. Wholeness is inexorably linked to holiness and, interestingly, the word “holy” has its roots in “hale,” which means sound, whole, and happy. So many of us have been taught that holiness is a distant, mysterious, and unreachable state reserved those in the higher echelons of organized religion. I say phooey to that because being holy is a highly creative way of being that demonstrates that which cannot be politicized, organized, or exclusivized. In the alchemical model of spiritual transformation, a holy person is one who has gone through all the lower stages: calcination (burning out the ego’s control), dissolution (feeling and taking ownership of the emotions), separation (deciding what’s important) – many times! – and has then moved into numerous explorations of the stage of conjunction to discover where one’s heart is. After this basic work is solidly integrated, we are free to expand our determination to become whole through the stages of Putrefaction-Fermentation (where we experience wrestling matches with our inner demons), Distillation (where we become far more interested in the greater good than merely in our own, and finally Coagulation, which is where true wholeness/holiness is revealed. This may sound like it makes all the more difficult stages worthwhile – and it does. However, as Joseph Campbell might say in his Hero’s Journey model of personal transformation, the end is just the beginning. For as we have strengthened ourselves in all ways and moved into the realizational state of consciousness, we also move into more responsibility to ourselves and our growth as well as to others and all of Life Itself. This is no resting place, other than on deep inner levels. It requires more responsiveness than ever before, more discomfort and pain than when we were at varying degrees of unconsciousness if we slip off the pathway, and more vision of how our moment to moment decisions can affect entire universes. It is also filled with many moments of joy and expansive understanding and perception of life that we never experienced before. In the previous article, I described Distillation as the stage where we are spiritually and emotionally mature enough to merge with the collective conscious and unconscious without becoming devastated by what we find there. A sure proof that we aren’t truly as enlightened as we would like to think we are is when we react (as opposed to respond) to a situation as awful rather than full of awe and potential for learning. A change of perception and attitude is the key to being fully in command of our wholeness. When we are at the mercy of our egos or unredeemed emotional states, we are not free to see all available options. We tend to be myopic and react accordingly. And we usually think of these narrowly perceived situations as negative, bad, or threatening, so our reactions cause us to close up, defend, or attack. This prevents growth and it is certainly not an experience within a Coagulated consciousness. A most important point to be made here is that few people reach the point of complete Coagulation. Most of us must continue to go through all of the stages again and again, each time further refining the golden essence within us. It takes time to become fully awakened. And the necessary key is that having a goal to become enlightened actually prevents most people from achieving it. For true spirituality has no goal other than to remember one’s true nature. In the moments of experiencing that truth, we know that everything about us and everything in our world is perfect – not in the usually accepted definition of perfection because that’s impossible – but everything is exactly as it needs to be in every given moment. It’s all a part of the discovery. Nanci Shanderá, Ph.D. is a Mystery School teacher and spiritual counselor-dreamworker at EarthSpirit Center in Eagle Rock, California. This article is excerpted from her book in progress: The Gold Within You: A Guide to Understanding and Celebrating What’s Right with You. She can be reached at 323-254-5458. Her website is www.EarthSpiritCenter.com. << Click on book cover to order. This book is about the common source of mythology and religion in Ancient Egypt. The author believes that by uncovering the phenomenal origins of the archetypes—”that which happened in the beginning”—and by expounding on the meaning of the ancient Wisdom, known as the Oral Law, or the Lesser and Greater Mysteries, the book will cause the mind to expand inward, peeling away the sheaths of unhealthy mental debris that cover the “Luminous Sun” shining at the core of your being. Your mind then begins to brighten perceptibly, and the life-giving bioenergy that animates your body circulates more freely and more abundantly. Perhaps the most remarkable thing about The Secret Teachings is that one need only read a few paragraphs a day in order to benefit tremendously. Within weeks you begin to see everything in a different, more wholesome light. The author says there is an area in the brain, long neglected, that has become dormant through lack of stimulation. In order to bring this particular part of the brain into activity again, it must be nourished with knowledge that is unlike anything to be found in other books available to the public. Although such an idea has no real basis in science as yet, the author claims that readers will experience the proof both mentally and spiritually. In the Introduction, Kiefer relates the story of how his friend, the late U.S. Senator Harold E. Hughes of Iowa, was visited by two angels, who appeared to him as men almost eight feet tall and clothed in white. They came to deliver a prophecy concerning the effect these teachings will have on the mind of anyone who is exposed to them. It is now more than thirty years since that extraordinary event occurred, and the publication of The Secret Teachings represents the final step leading to the fulfillment of the prophecy. In the rest of the Introduction, you will glimpse a side of nature that promises to reveal itself more widely than ever before. Not long ago, a well-researched television documentary revisited the lost continent of Atlantis. In recounting all that is known from the literature, it was pointed out several times that Plato was simply describing a myth, not an actual event. But inasmuch as the writer was unable to explain how the myth originated, or its meaning, viewers were as puzzled as before. The Secret Teachings is not even remotely similar to such TV shows. Not only does it describe the well-known myths, among many others that are unknown to most, it tells how they originated. You will discover that everything had to have had a beginning in natural phenomena. An advanced “Personal Alchemy Workshop” with Dennis William Hauck will be held at the EarthSpirit Center in Los Angeles from 10:00 to 5:00 PM on Saturday, May 11. Spend the day with one of the world’s few practicing alchemists, as he reveals ancient methods of transformation and helps you apply them to your own life. Learn how the alchemists worked simultaneously on all three levels of reality – the physical, the mental, and the spiritual – to achieve their transmutations. $75. Seating is limited! For registration, contact the EarthSpirit Center at 323-254-5458. Fax: 323-254-4850. Email: info@earthspiritcenter.com. Website:www.EarthSpiritCenter.com. Booksigning. Des Moines, Iowa. June 19, 2002. A free public lecture and booksigning with Dennis William Hauck will be held on Wednesday, June 19, at the Morning Light Books store in Des Moines. The event starts at 7:00 PM. For more information, contact Morning Light Books, 3111 Ingersoll Ave., Des Moines, IA 50312. Phone: 515-255-9256. Solstice Alchemy Workshop. Des Moines, Iowa. June 22, 2002. Spend the day with practicing alchemists Dennis William Hauck in this all-day workshop on the ancient techniques of alchemical transformation. 10:00 AM – 5:00 PM on Saturday, June 22, in Des Moines, Iowa. This unique workshop focuses on advanced methods of personal transmutation based on the operations of alchemy. Learn how to apply the alchemists’ secret formulae to practical work in relationships and careers. Resonate with the magical imagery of the alchemists’ drawings, harness the archetypal power of the elements, and experience alchemical change within your own being, as you progress through each operation. Seating is limited. Cost: $79. There will also be a free public booksigning on Wednesday, June 19, in Des Moines. To register online with a credit card, clickRegister Now. I have gotten a lot of email on the last editorial, most of which is in the same vein as the insightful example from Bob Becker below. People are not only sensing “something in the air” but truly realize it is somehow connected with their own inner states of consciousness. To me it seems as if the divine is actually getting closer. We are undergoing a paradigm shift from the ancient dictum of “As Above, so Below” to the modern realization of “As Within, so Without.” This is not only happening in people, but also in our most advanced sciences and spiritual disciplines. The question I am often asked is why. Why all the optimism among spiritual seekers that “something wonderful” is approaching when the world seems to be falling apart around us, when religious dogma is responsible for so much hate and murder? What hope is their in a world where people will sacrifice their lives in acts of death and terrorism but have no idea how to sacrifice their lives in acts of life and love? In a world of fatalistic philosophies, widespread hatred, and rampant materialism, why — in all this darkness — are some people suddenly becoming more hopeful and spiritually optimistic? Hundreds of people are telling me this; I feel it myself. A new stage of alchemical transformation is beginning on the planet, and we are all the catalyst. For, contrary to much of the shallow rhetoric of our New Age gurus, it is not what we say or think that counts. That may seem like a shocking statement from a lifelong Hermeticist, but I have found that the fluff of enlightened sound bites and trademarked spiritual methods mean nothing. The lip service of rehearsed ritual and pleading prayer are equally self-serving. It is only what is truly in the human heart that counts. For most of us, our hearts remain silent witnesses to the folly of our egos, but once in awhile the power in our hearts is demonstrated for all to see. That happened recently. As a mathematician, I have been supporting and helping interpret the statistical results of Princeton University’s Global Consciousness Project (GCP) since 1999. In math, the First Matter of the alchemists is represented by mathematical chaos (strings of completely unconnected and meaningless numbers). Today computers can be programmed to generate endless chaos using sophisticated random number generators. In the GCP, 40 random number generators are scattered around the globe and feed their chaotic stream of numbers into a central computer for analysis. Every once in awhile, some of the numbers show an ordering or coherence. What the project has discovered is that in times of events that touch the hearts of people around the world, these periods of ordering of chaos are more pronounced and last longer. Wars and natural disasters such as earthquakes cause changes in the output of the random number generators. To date, the most pronounced change occurred on September 11, 2001, and lasted several days. Physicist Roger Nelson, who heads the project, summarized the intriguing effect: “Some kind of great coherence arises when people are all engaged in the same event, sharing the same emotions and attention in some event of deep meaning for them. That coherent presence in the world is what causes our numbers to be different from what they should be.” In other words, from the perspective of what is happening alchemically on the planet, it is only what is truly in the human heart that counts. You can view that “coherent presence,” which is the collective heart of our planet, in real time by visiting http://noosphere.princeton.edu and selecting “NetStatus” and then “Real-Time Display.” What you will see are 40 bar-graphs of coherence from each of the random number generators. Brighter colors and longer bars indicate increased coherency or large deviations from chance. Turn on your speakers to hear the “heartbeat” of the planet, which plays musical notes with pitch and loudness related to the momentary data values against a steady background of a normal beating heart. If you hear crashing cymbals, a major coherency has occurred. A new stage of alchemical transformation is beginning on the planet, and we are all the catalyst. For, contrary to much of the shallow rhetoric of our New Age gurus, it is not what we say or think that counts. That may seem like a shocking statement from a lifelong Hermeticist, but I have found that the fluff of enlightened sound bites and trademarked spiritual methods mean nothing. The lip service of rehearsed ritual and pleading prayer are equally self-serving. It is only what is truly in the human heart that counts.